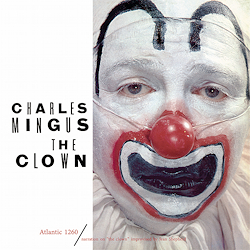 ﻿Who hasn't got an ancient, worn-out copy of "The Clown" on his shelf, with a tatty cover and torn inner sleeve? Or maybe one of the rare re-releases made of cheap, thin vinyl with dreadful graphic art? And if you haven't heard this gem for a long time, despite the flood of Mingus LPs, CDs and downloads on the market, then you really should seize this opportunity to do so. "The Clown" was, and still is, an absolute must-have for every jazz collector. The small ensemble, only five musicians, came into the New York Atlantic Records studio in March 1957 to record music exclusively composed by the double bassist. Over the next 15 years, three of them were to be heard in numerous concerts with other ensembles. But the original recordings on this LP were the most deeply concentrated, the most versatile, and quite simply the best of all. The more so because the label attached great importance to optimal studio conditions and allowed the instrumentalists plenty of time to make the recordings.